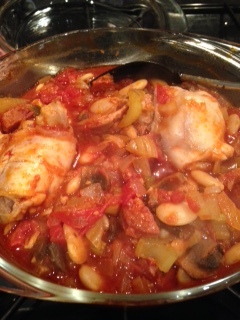 I mentioned that I went to a friend’s for dinner last week and she made a delicious chicken and chorizo casserole with butterbeans. I loved it, so recreated it yesterday. I had a look at a few similar recipes on the internet, then adapted it to what I had. It is amazing how tasty a butter bean becomes when it is stewed with chorizo and smoky paprika. I put mushrooms in to use them up, but think it would work well with a chopped red pepper instead. This is lovely served with plain rice and salad or a vegetable. Yum! 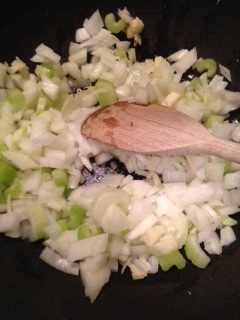 Heat some oil in a large pan, and add the onion, garlic and celery and sweat gently for 5 minutes. 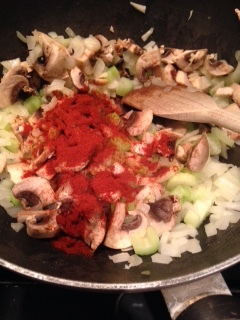 Add the mushrooms and paprika and continue to fry gently for a further 5 minutes. Add the tomatoes, stock, butter beans and seasoning and stir. Place the chicken in a large casserole dish and pour the sauce on top. Cover and cook in the oven for about an hour. This is quite inexpensive for entertaining and I will definitely be doing this again. DD 1 isn’t keen on chorizo, so I might replace that with bacon. I made double so no cooking for me today – I don’t mind the same thing two days in a row, especially when it is really tasty! Check out my Frugal Recipes page for other ideas. That looks delicious. I have a version of this casserole that’s cooked in a slow cooker and has pearl barley added. It ends up like a lovely creamy, spicy pearl barley risotto so you don’t need to serve it with anything else. It also uses smoked paprika (which I love since I discovered it a few years ago) but doesn’t have beans in it.